Chris Large/FX, Copyright 2015, FX Networks. All Rights Reserved. Bokeem Woodbine broke onto the scene with the 1993 made-for-HBO crime flick Strapped, and he's been confronting onscreen adversaries -- from the aliens of Riddick to the Mafiosi of The Sopranos -- ever since. 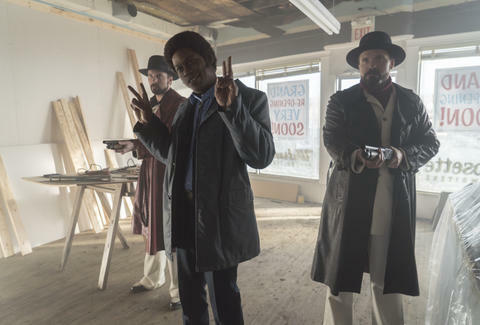 The actor is back at it again with the role of gangster Mike Milligan, whose verbose menace has been a highlight of the second season of FX’s Fargo. Despite having recently lost his cell phone, Woodbine managed to connect with us to talk about the role, chilling in Calgary, and working with Hungarian vampires. You're without your cell phone and people can still find you -- that’s impressive. You know, it’s not gonna last for long. I can string this out for another week or two, and then I’ve got to capitulate. Things grow exponentially in funky directions when you’re not reachable. What word best describes the experience of joining this series? The word surreal is used often in our industry, but this is definitely a case of surrealism for me. The whole experience, from first hearing about the role up through it actually airing, has been an exciting time in my career. But I also feel like I’ve been swept up in the momentum of something that has a life of its own and is such a powerful, amazing creation. Mike Milligan is distinct among Fargo's ensemble, but also in the landscape of your career. When I first heard about the role and I got the e-mail saying I had to audition for it, I thought it was a mistake. I called my agent and said, "Hey, this is an audition for a 50-year-old, potbellied Italian cat. [Laughs] And their answer is generally, “Well, that’s what they have written, but just go in there and show what you can do and maybe you can change their mind.” Rarely does it happen, but I’ve been able to sway people. Fargo is such a specific thing and has such a specific resonance that I really didn’t see myself in that world, and the material that I got was so limited, so it really struck me as odd to say the least. But at the same time, being a Fargo-phile and having so much respect and reverence for the film -- and things that it represents as far as pushing the envelope -- I was definitely compelled to try. So I dialed in, and 48 hours later I was in the room with Noah [Hawley, the series creator], and I read for it. I actually kind of flubbed the line; I put one word in a different space, and I kind of rearranged the line. So I figured it’s not happening. And then 48 hours after that, I got the call saying that I had the gig, and it was just crazy. Getting to play Mike Milligan was unexpected. This whole thing has just been a fantastic experience, and at the same time, so strange -- almost like an episode of Fargo in real life. What's it been like shooting up in Calgary? It’s cold up there! Even though I was told by the locals that it was a mild winter. It was a little isolating because I didn’t know Calgary that well and I was really trying to put my best foot forward. You’ll find yourself doing nothing but walking through the +15s, which are these elevated walkways -- the most bizarre, science-fiction kind of thing. It’s so cold that they built paths on what I guess would be the second story, and instead of the subway going underground these things are above the ground, and you can walk through them and they’re heated. I think it’s a great idea, but it will boggle the mind of a New Yorker like myself at first. It was the perfect environment to just focus on what I wanted to do, and I think that’s probably true for everybody. Your career is so varied. What's the most interesting place you’ve worked? Your career has evolved so much. What do you owe that to? I guess I resigned myself to the understanding, based on my own personal experience, that the best way to figure out this industry is to accept that you will never figure out this industry. So many things make no sense at all. Some of the most prolific, sincere, hardworking, talented people don’t really get a break. And adversely, you might have some people who are just more personality than talent per se, more of a hollow statue, and they are the most successful. These things don’t make sense, and it was a breakthrough for me to kind of accept that. When did you have that breakthrough? Fairly recently! Probably in the past four or five years. I like logic. I like things to make sense. It’s cool when things are existential and they’re subject to individual perception, but there are certain things in the three-dimensional world that I like to make sense. So it was hard to realize, "Yo, this town makes no sense at all. It really doesn’t." When I accepted that, the strangest thing happened: not overnight, but positive things slowly started happening. ​Does surviving in this business, then, require self-assuredness? It can hurt you in an industry like mine when you’re so sure of who you are and you’re so confident of who you are [that] people might say “Well, he’s so confident, we don’t see any malleability.” And those are just people you have to prove wrong. Like, yo, I can be anything creatively. But you know what? You just keep putting one foot in front of the other and keep your eyes on the prize. Danielle Henderson is a New York-based writer who thinks Fargo sounds like a lovely place to be murdered in the most disgusting ways imaginable. She writes mostly about television, which is an amazing thing to rub in your mom's face. You can find her on Twitter @knottyyarn.